The Lone Ranger is an enjoyable Western adventure enlivened by strong performances, stunning location work and some exciting action set-pieces, but it also suffers from an over-inflated running time, an uneven tone and a plot that makes less and less sense the longer it goes on. Directed by Gore Verbinski, The Lone Ranger is a Western adventure set in 1860s Texas, based on the popular character that began life as a radio serial in 1933 and spawned books, comics and a long-running 1950s TV show (the less said about the 1981 movie, the better). When notorious killer Butch Cavendish (William Fichtner) escapes from custody, educated law man John Reid (Armie Hammer) is deputised by his Texas Ranger brother Dan (James Badge Dale) and joins the pursuit, only for Cavendish's men to murder the entire posse in a vicious ambush. 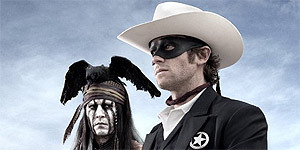 Nursed back to health by dead-crow-wearing Native American warrior Tonto (Johnny Depp), Reid is persuaded to don a mask and adopt the identity of The Lone Ranger, dedicated to avenging his brother's death and bringing Cavendish to justice. With Tonto as his sidekick, Reid embarks on a secret mission and uncovers a web of corruption that involves the construction of America's first transcontinental railway, an ancient silver mine and a brewing conflict between the settlers and the local Comanche tribe. Hammer and top-billed Depp make an appealing double act as The Lone Ranger and Tonto, with Hammer providing erudite handsomeness combined with goofy comedy timing and Depp delivering an enjoyably quirky, deliberately non-caricatured performance that owes at least a passing nod to Buster Keaton. There's also strong support from Tom Wilkinson (as dastardly railroad tycoon Latham Cole), Ruth Wilson (as Reid's feisty love interest-slash-widowed-sister-in-law Rebecca), William Fichtner (deliciously evil as Cavendish) and Helena Bonham Carter in a scene-stealing cameo as one-legged madam Red Harrington. Reteaming with Depp after both the Pirates movies and Western animation Rango (whose gleefully surreal influence occasionally seeps through here), Verbinski orchestrates a number of terrific action set pieces, the highlight of which is a thrilling finale set on a train, all of which is, gloriously, set to the William Tell Overture. He also includes a number of fan-pleasing nods to classic Westerns and makes strong use of some stunning locations, most notably John Ford's beloved Monument Valley. The film's biggest problem is its grotesquely overinflated running time, not least because the meandering plot makes less and less sense the more it goes on. One thing that should definitely have been cut is the 1933-set, Little Big Man-style framing device, with an improbably aged Tonto recounting his adventures to a young boy (Mason Elston Cook). On top of that, it's fair to say that the film also suffers from an uneven tone in places – Cavendish cutting out and eating Dan's heart, for example, seems distinctly out of place in a film aiming for family entertainment. Similarly, several of the gags (e.g. the horse in a tree) fall painfully flat and should probably have been cut. The Lone Ranger is well acted and delivers pleasingly old-fashioned Western entertainment, but it's also let down by an uneven tone and fails to justify its arse-numbing running time.